For each division I’ve laid out the top squad players on a pitch, in a style reminiscent of the official Premier League version and using the same number of players in each position, for both the most recent month and the season so far. 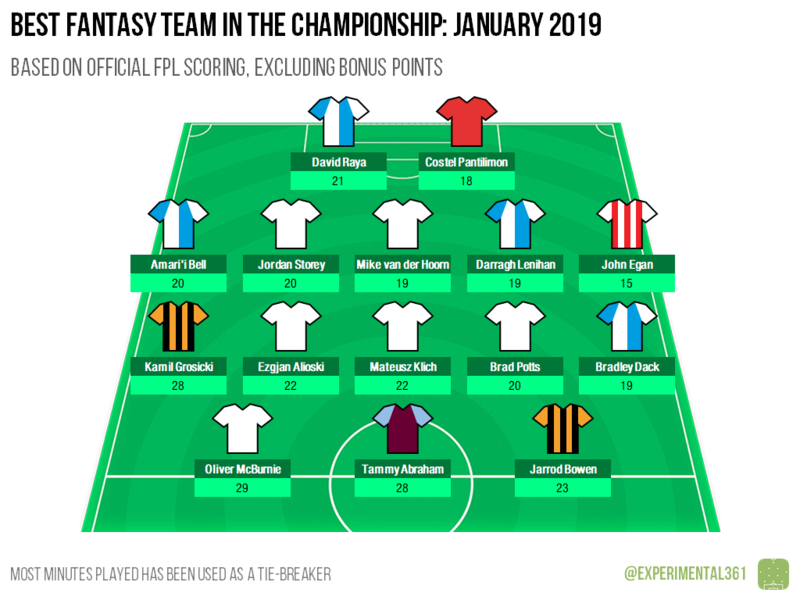 It was a good month for Blackburn who have four players in the division’s top-scoring squad – no other team had more than two. Four clubs managed that though: Hull, Leeds, Preston and Swansea (apologies for the similar kits) each had a pair of players in there, with Swans’ Oliver McBurnie the top performer of all with 29 points after netting 5 goals and getting an assist in just three appearances. Tammy Abraham also grabbed 5 goals and played in one more match, but McBurnie’s assist gave him the edge overall. 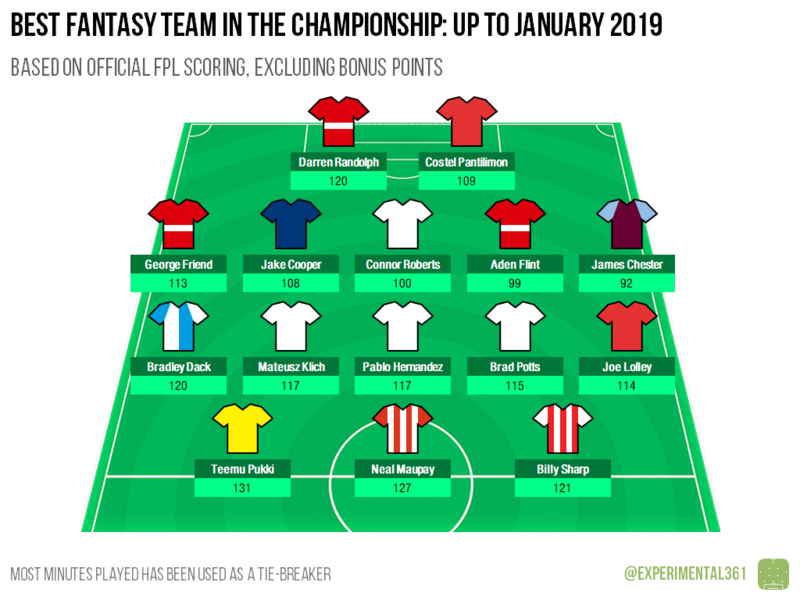 Looking at the season so far, the best-scoring player is Teemu Pukki of Norwich with 131 points and the other two forwards have also scored more highly than anyone else. Middlesbrough have the most representatives with three, all of whom are largely there thanks to keeping 13 clean sheets apiece. Leeds and Forest are the only other sides with more than one player in the top squad at present. Burton look to have put their hammering at the hands of Man City behind them, with four of their players in League 1’s top-performing squad this month. 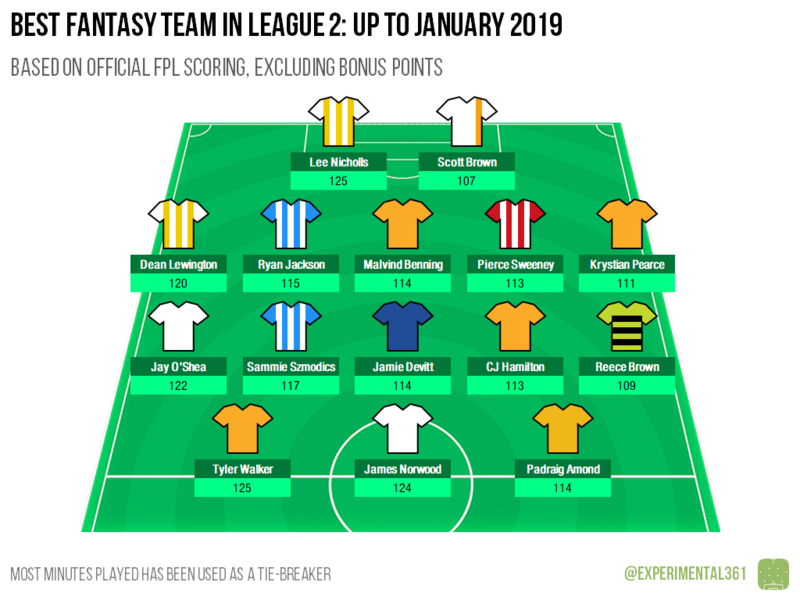 Barnsley, Luton and a resurgent Plymouth also have multiple representatives, with the Pilgrims’ Ruben Lameiras the top player in the division overall after scoring 5 in 5. James Collins of Luton wasn’t far behind and actually scored one more goal, but forwards get fewer points for finding the net. 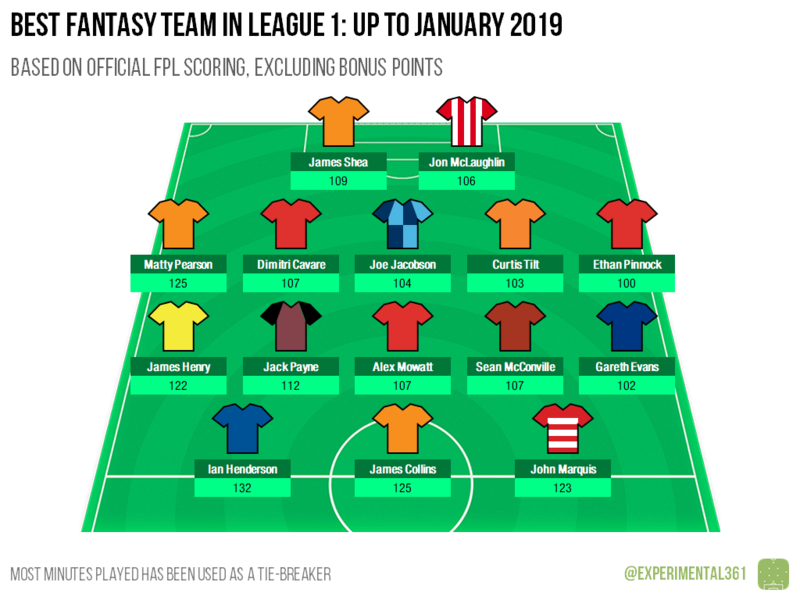 Two of the top three – Barnsley and Luton – have three representatives apiece in the current top squad – but neither employ the top player of all: Ian Henderson of Rochdale has a whopping 132 points to his name – the most of any EFL player at the moment. 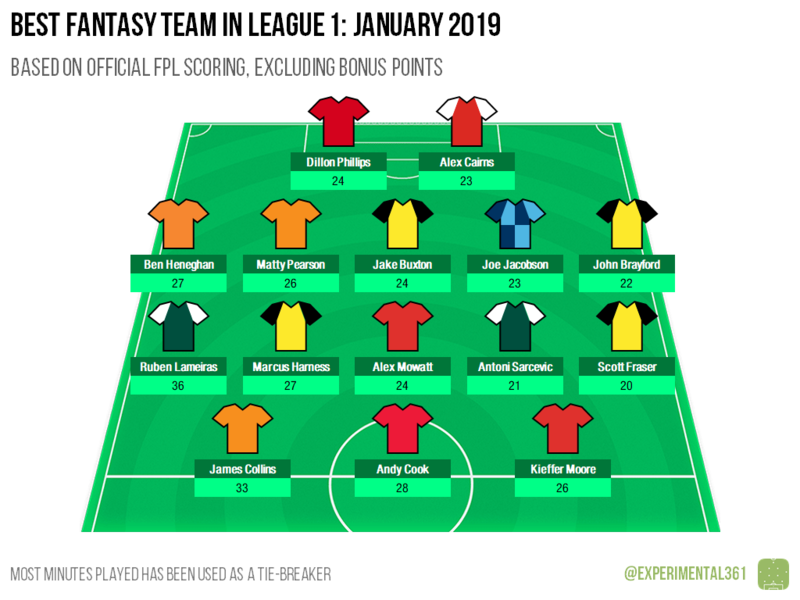 Just like in the other two divisions we have one team with four representatives: Forest Green have had a fantastic month and have players in all three outfield positions. Defender Liam Shepherd scored particularly well with a goal and two assists on top of his three clean sheets. 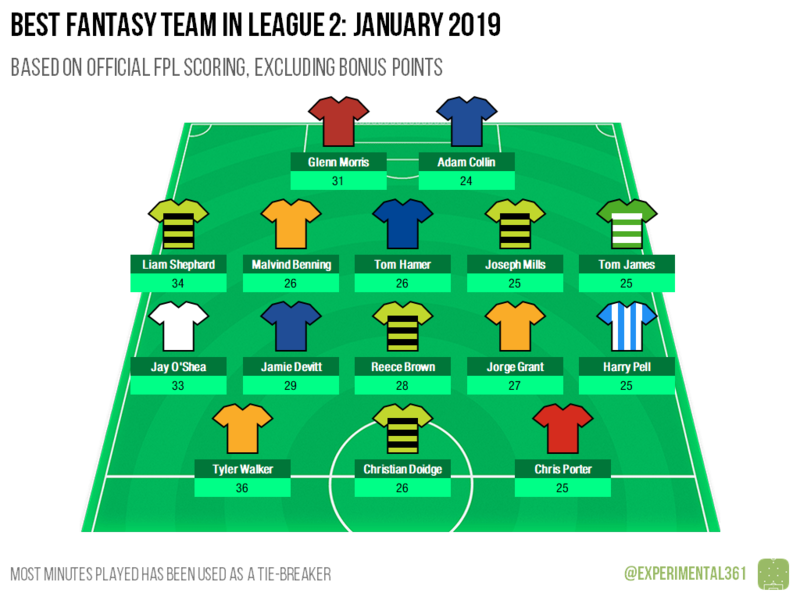 Mansfield have three, including the top-scoring player of all in Tyler Walker, who was involved in 6 goals this month. Carlisle don’t appear to have been affected too much by their change in managers given that they’re the only other club with more than one representative. Mansfield have an impressive four representatives in the squad of the season so far, including at least one in each of the three outfield positions and one of the joint top-scoring players in Tyler Walker. Only two other sides – Colchester and MK Dons – have more than one player at the moment, with Dons keeper Lee Nichols level with Walker on 125 points.